This Aloo Posto Recipe is a classic example of how just a few ingredients can yield a creamy spiced potato dish. This is an ever-popular dish hailing originally from West Bengal. Bengali Aloo Posto is a simple dish made with spiced potatoes and cooked in chilies, turmeric and poppy seeds. No Bengali vegetarian platter is complete without this Aloo Posto. 1. Peel up the potatoes and wash neatly. 3. Soak green peas for 3 hours and boil them 90 percent. 4. Cut potatoes in equal dice pieces. 5. Grind poppy seeds into the mixture jar. 6. Take a pan and add oil to it. 7. When oil gets heated, put onion seeds, cumin seeds in it. 9. 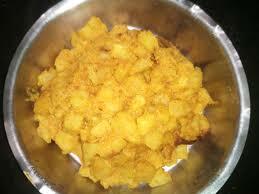 Then put potato cubes into it and stir it well. Then put a lead on it and cook it for 10 minutes. 10. Meanwhile, check the potatoes. don't allow it to burn if it happens to sprinkle some water on potato's cubes. and put green peas into it. 11. After 10 minutes put poppy seeds ground paste into the pan of potatoes. 12. Mix it well and let it cook for another 5 minutes. 13. Then put chopped green chilies in it. 14. Add salt to it. 15. Sprinkle some chopped coriander on it and serve it with pure, rice, chapati, phulka, paratha as you want.